I plan on buying an extra set of wagon taillights and modding them. I'd love to be able to make a CLEAR set. Ive seem it done on 3rd gen camaros and 90s JDM cars but I wonder if it could be done on a RMW. They make clear lenses for the Caprice sedan but not the wagon. I'm not ricing out my wagon, I just want to do something to make it look a little different. My 96 is mostly stock other than LED headlights and Rally wheels. I'll make a post if I figure something out in the future. which led headlights did you use, and how satisfied are you? Any update regarding your plan? I'm curious about the clear taillights. I used sylvanias for tail lights but I was not pleased. I haven't taken them apart yet but I'm going to see if I can separate the lens. I like the sylvanias for the back up lights, but for the tail lights they did not work, even with a flasher module. I'm going to be trying some others out soon that are supposedly build in with resistors. I am however satisfied with the Sylvania led bulbs for the backup lights. led bulbs. if you want clear you can try to heat some pyre-ceram its like plexy but bends and molds better. I've always wanted to tail light options. I'm finally working on making a borderless set now. I'm just looking for a set of caprice spares to make that work. I'll post updates here when I get it going. Hoping that I can make this my priority project for this month. Yeah lemme know how it goes. Next week I'll be trying to re wood the car with vynil so the tail lights are gonna have to wait. In may I'll most likely be getting around to the tail lights. Also, post some pics of yours! Good luck with the re-wooding. 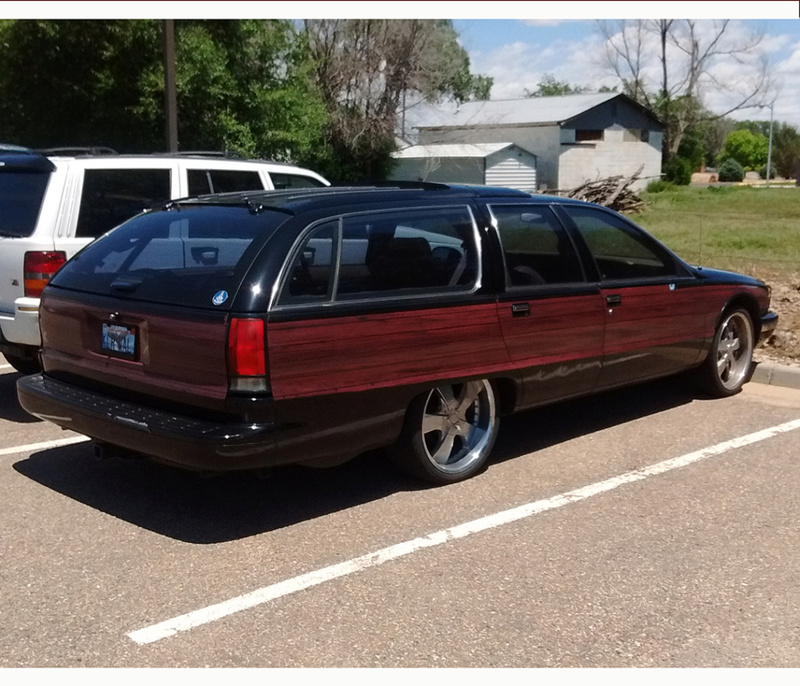 I did that a few years ago with custom printed woodgrain from Woodgrainforwagons.com. Great product, horrible horrible service. Thanks Sprocket, I have a caprice set in the mail now and will be getting started soon. I'm starting with a Caprice set because it can easily be cut down to fit a RMW if it still has the stainless trim or fit better if without. I'll start my own thread when I get started for those interested. If they come out nice and the effort is minimal, I might consider a small run for others interested. Subject: Re: Tail light mod ideas?